First Line: There is a canyon in the heart of Wyoming carved by a river called Wind and a narrow, opposing, two-lane highway that follows its every curve like a lover. Wyoming highway patrolman Rosey Wayman is worried that she might be crazy. A recent transfer to the Wind River Canyon area, she's begun receiving "officer needs assistance calls." What's the problem? The fact that the calls are from the legendary Arapaho patrolman Bobby Womack-- who's been dead for thirty years-- has both Rosey and her supervisor doubting her sanity. Rosey's supervisor asks for help from Absaroka County Sheriff Walt Longmire and his friend Henry Standing Bear. They both know and like Rosey, and they want answers. Time is running out on their investigation, but one way or the other The Highwayman is going to have his say. I'm such a Craig Johnson fan that I don't care if what he writes is short like this novella or a full-length book, as long as the man keeps writing. As popular as he's become, I have to wonder how on earth he finds the time to write because he always seems to be on tour. Have any of you read Johnson's last novella Spirit of Steamboat? I have, and I still remember those barn-burning action scenes that gave me paper cuts, I was turning the pages so fast. Well, you get more of that kind of action here in The Highwayman. The setting, the characters, the dialogue, the action, the story... you get everything that all we die-hard Craig Johnson fans have come to expect-- even a logical explanation for almost everything. Trust me. 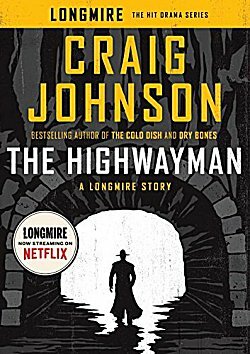 If the only thing you know about Craig Johnson comes from watching the Longmire television series-- as excellent as that series is-- you really, really need to read the books. What better place to start than with The Highwayman? Once you've read this one, you're going to be going back for all the others. Craig Johnson is one of the very best writers in the business. Oh, I'm so delighted that Johnson keeps up the pace and the quality here, Cathy (not that I'm surprised, mind). And it sounds like an absolutely engrossing read, too. And I echo your view. The show is great, but people, please read the books! What she said... err... we said! This sounds good. I have never read one of the books, or seen the show. Be still, my heart! Oh, Ryan, you just gotta read this book-- I need another convert! LOL Honestly though, I absolutely love Johnson's books. I have since the first one came out in 2004. Wow, did I get behind reading posts! Read this this past weekend. Quite enjoyed it. Still working my way through the rest of the books, then maybe to the tv series. Really, really like Johnson's writing voice. He does a fabulous first person. Not a lot of writers can do it that well. I replied to this, but it seems to have vanished, so I'll try again.